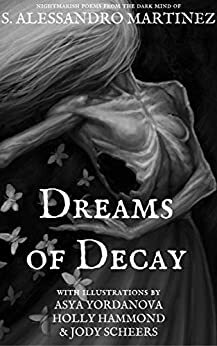 Dreams of Decay (2016) by S. Alessandro Martinez is a wonderful, chilling book of poetry with brilliant illustrations by Asya Yordanova, Holly Hammond and Jody Scheers which help to bring the poems to life for the reader. The collection opens with The Book of Dead Things and Scary Stuff, a cleverly written poem and perfect opening poem which sets the tone for the rest of the collection. We move then to The Boy Who Breathed Darkness which is a brilliantly dark take on the story of Mary and Jesus with the angel now a demon and God now the devil. Glutton follows and is a wonderfully ironic poem about a woman married to a man with “an appetite like sin”. The Girl With No Face follows and is a poem about a girl who is bullied and has a great twist. The twists in a lot of the poems are very good such as in the following three poems New Mummy when the character Tim goes into a store and without giving too much away doesn’t come back out, the poem which follows Sam and the Spider which also has a great twist at the end and Are You Afraid? in which a girl makes a bet with her best friend to go into a graveyard. The collection continues with The Thing from John’s Head, a dark psychological poem followed by a short well-written piece called Save Me. The Ghouls follows. It is set in an old graveyard where someone is watching the ghouls eating the body of some unfortunate and also has a great twist at the end. The next poem stuck in my head long after I read it. It’s called The Girl Who Woke Up Dead. If you are in any way claustrophobic, you will find this poem very chilling. It sent a chill up my spine. There is a great storytelling quality to this poem too. I think this poem and The Boy Who Breathed Darkness are probably my two favourite poems from the collection. It’s followed by the chilling poem The Cellar and The Thirteenth Hour, a poem about a grandfather clock which rings an unlucky thirteen times. Continuing the collection is The Present which takes place at Dan’s 8th birthday party when his Mum hires a sinister clown. It is followed by another well-crafted poem called Daddy Long-Legs and No One Was There, a psychological, chilling poem. Next up is Death’s Embrace about a young boy Homer who is afraid of death so his parents bring Death over to visit their home in an effort to show Homer that death is nothing to fear. Wonderfully storytelling. The Necromancer’s Spell follows. The descriptive qualities in this poem are absolutely stunning. Flows beautifully and effortlessly. Possession Terminated is next. It has four lines per verse and the rhythm of the poem is brilliant. It’s a very well structured poem which again flows effortlessly. The Viscera Queen is the penultimate poem of the collection. It has a very storytelling quality to it and follows the story of a tyrant Queen who has sharp teeth in which to eat her enemies alive and tortures her subjects. Closing the collection is The Corpse Machine about a killing machine. It brings the collection perfectly to a close. Following the collection is some brief biographies where you can find out more about the author and the illustrators. I very much enjoyed the entire collection. I love horror movies and anyone who does will adore this collection. They are like mini movies only on paper with the illustrations almost like a still from each mini movie. It’s not a collection of poetry for the faint-hearted but for anyone who likes their poetry a bit dark and with meaning, this is a stunningly interesting and professional collection. This entry was posted in Books and tagged Amazon Books, Asya Yordanova, Books, Dreams of Decay by S. Alessandro Martinez, Holly Hammond, Jody Scheers, Poetry, Poetry Collections, S. Alessandro Martinez. Thank you so much for the fantastic review. It makes my black heart beat with joy! I really appreciate this great review for Dreams of Decay!